Just two months after her 19-month-old daughter, Emeline "Emmy" Miller, died after drowning in a neighbor's pool, Morgan Miller is opening up about the toddler's final tragic moments. 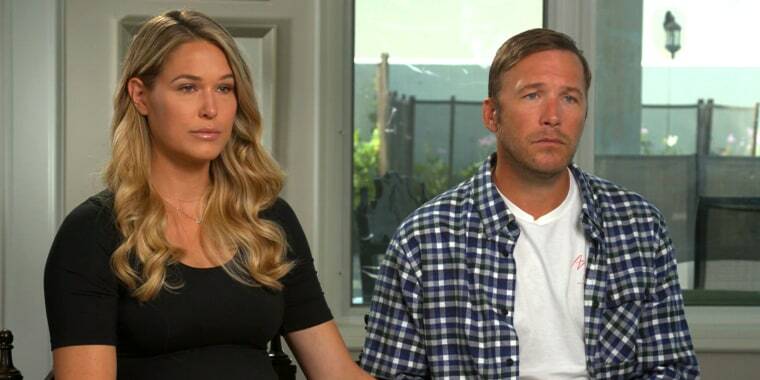 On Friday, the pro beach volleyball player, whose husband is former Olympic skier Bode Miller, shared a heartbreaking photo of herself cradling their daughter as she was being given oxygen after the tragic accident. “I wish I could have one more day to hold you, but until that day comes, continue to work through me and give me the strength to bring awareness, my love,” Morgan Miller, 31, wrote in the caption. "I told you as I held you in this moment that you could still change the world, you could still move mountains." The grief-stricken mom, who lives with her family in Coto de Caza, California, also honored Levi Hughes, a 3-year-old Tennessee boy who died in a drowning on the same day as Emmy. "Every step we take forward is because of you and Levi. Your footprint will forever be left on this world. I love you, My baby girl," she wrote. In late July, Miller and her husband visited TODAY, where for the first time they shared details of the tragedy to let other parents know how quickly kids can drown. "There's not a day that goes by that I don't pray for the opportunity to go back to that day and make it different. But now we have this opportunity to make other parents' days different," Miller told TODAY co-anchor Savannah Guthrie. "We have the choice to live our days with purpose, to make sure that no other parent has to feel what we're feeling," she said. On June 9, the day before Emmy died, Miller walked her kids next door to visit neighbors. As Miller sipped tea with a friend inside the home, her daughter wandered off for just a moment. When Miller noticed Emmy was missing, she rushed outside. “My heart sank and I opened the door and she was floating in the pool. And I ran and I jumped in," she recalled. While Miller performed CPR on her daughter, her neighbor called 911. An ambulance rushed the child to the hospital. Doctors initially told the Millers that Emmy might survive, but the outlook soon changed. In their grief, the couple, who are expecting their third child together, learned that drowning is the leading cause of unintentional death for children ages 1 to 4 years old. “Guilt is a very painful thing,” Miller said. “And even though it's awful and living with it is terrible, and I hope and pray and beg that it gets easier, I am now much more aware in that area to make sure it doesn't ever happen again."